You are so lucky to inherit your grandmother's blue and white pieces! Thanks for stopping over to say hi. Enjoy your Friday! Haha! That is awesome! Looking forward to checking out your guest post! I actually thought I was going to see that you in fact had your real pink pony! great photo. Hahaha, that picture cracked me up!! Oh, I'm glad. I thought you were getting all English-y and gender-confused. hahaha your hubby cracks me up! what, he doesn't have veto power over what pictures you post on your blog? uh,no. that wouldn't be any fun at all. It was great meeting you, a fellow Texan and London resident, over at Selena's blog today. I adore the Luberon area and visit there whenever I can find a chance. I'll be following along with your blog now. they definitely should be documented. love it!!!! 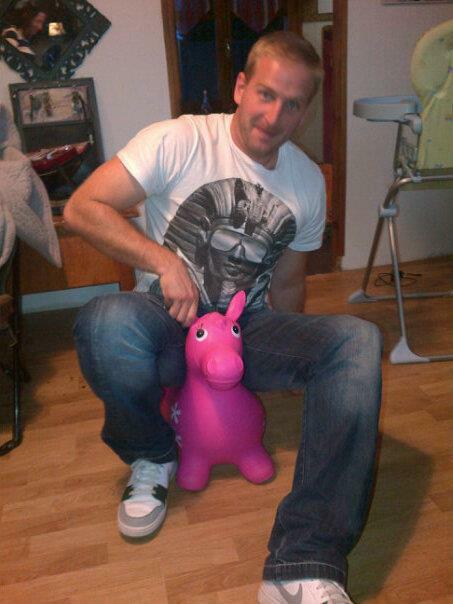 Any man that is confident to ride a pink pony totally rocks! That made me laugh out loud.